Shades of purple and rose define the year 2018! Pink and purple both can be quite sophisticated when the right shades are mixed with modern furnishings. If you want something bright and friendly, purple charcoal and woodrose is the perfect combination. See the image above for reference. You can never go wrong with a touch of blue. It does not only add a sense of calm but keeps your bedroom fresh and sophisticated. 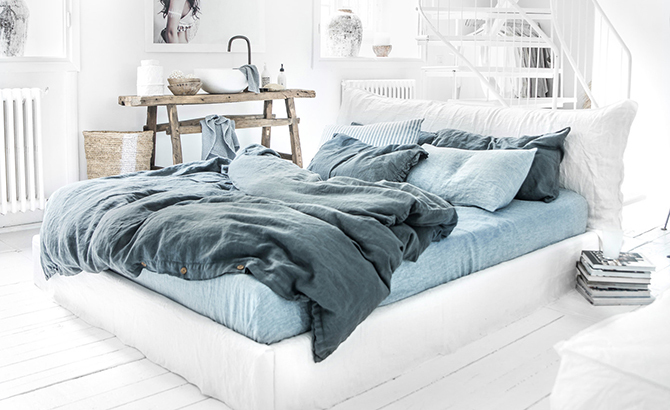 Though the real beauty is hiding in different textures and patterns like a combination of stone washed striped and melange bed linens in blue. Add more shades of blue to keep it looking even fresher. If light color walls and furniture dominate in your sleeping space, different shades of blue will create focus in the room. 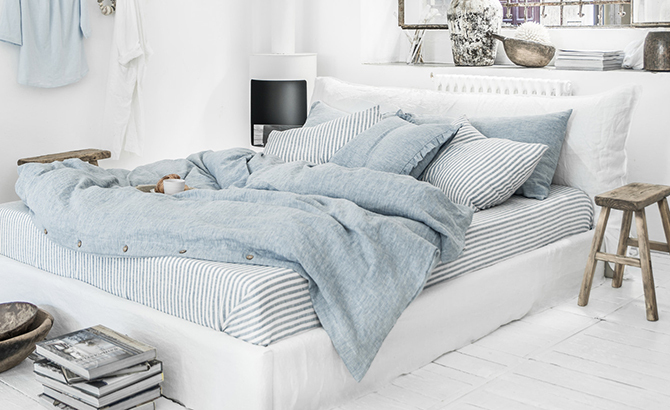 A mixture of gray blue, blue melange and white/blue striped bed linens. There’s nothing wrong with a pop of color, but don’t feel obligated to add color to a neutral room. 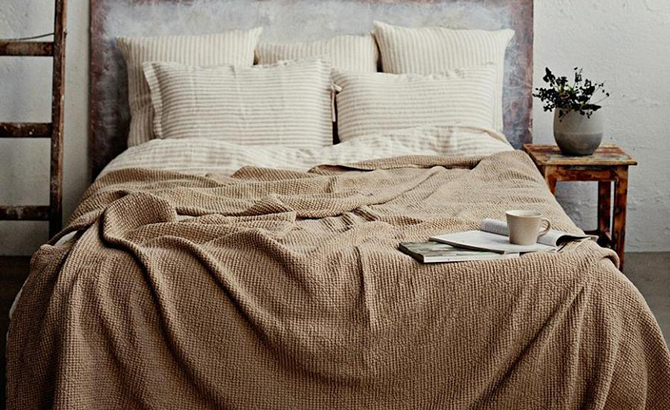 Natural and earthy tones in various textures are excellent to create a relaxing and soothing ambiance in the bedroom. If you feel there’s a lack of a brighter accent, add some colorful cushion covers, a fluffy rug or blanket. 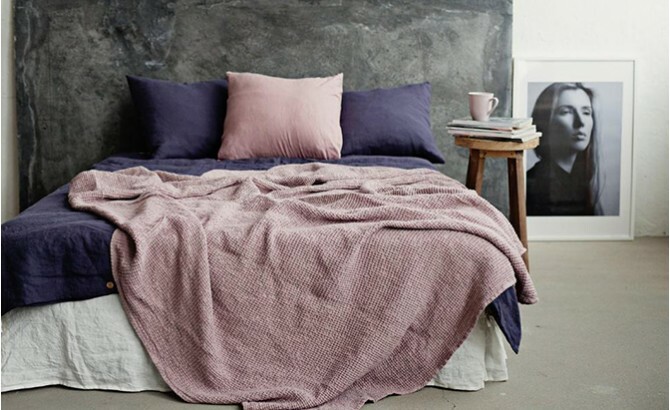 This decorating hack will add texture and significantly increase the coziness of your bedroom. Use a palette of pastel colors for a calm and tranquil vibe. 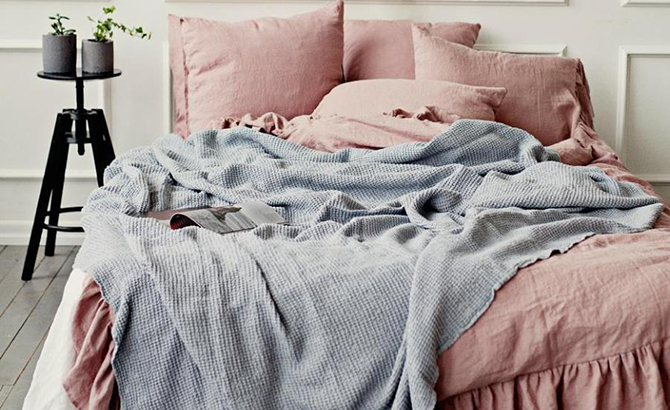 Dusty pink is a warm color that looks great when contrasted with cool neutral tones. A linen/cotton blanket in puffy honeycomb weave in light gray is a perfect match with a linen bed set in woodrose. 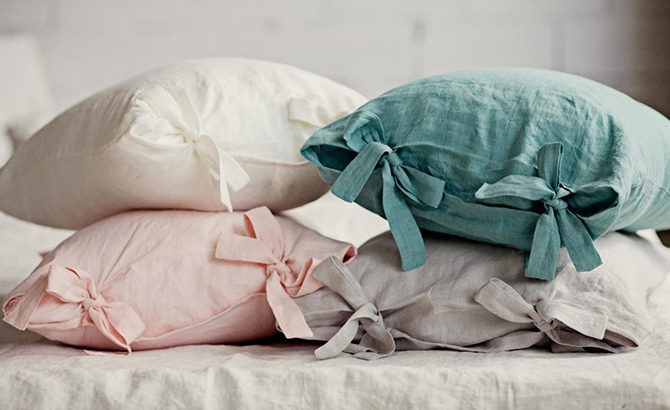 Or get a little bit crazy by combining more cushions in several pastel colorways. It can create an interesting and elegant bedroom color scheme. Mix, combine and create the unexpected! Learn how to correctly measure your bed for a bed skirt (dust ruffle). Which one should you choose based on your sleeping habits? Find the answer here.